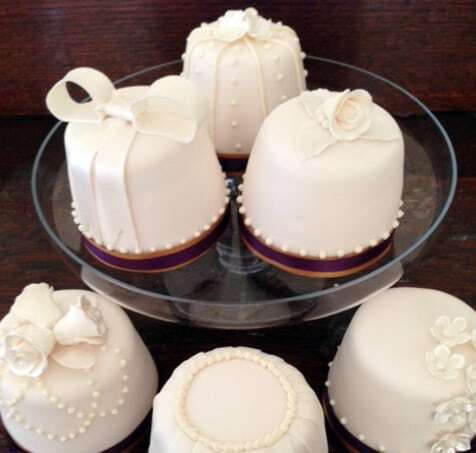 I was recently asked to supply 6 vintage inspired mini iced cakes by a couple who were getting married at The Fennes in Bocking, Essex, to give as thank you presents which I supplied in their own clear boxes. The bride supplied a picture of the cake she was having (her friend was making it) and her colour scheme, but left the rest to me. I picked out details from the cake and “voila!” 6 matching mini cakes! This couple are also going for a vintage theme, this time having a cupcake/mini cake tower with a birdcage cake topper. I would always suggest to couples who are contemplating mini cakes to mix them up with cupcakes too as mini cakes start from £8.50 and cupcakes from £2.75, so this would keep the cost down quite a bit. I’ll post a picture of the Birdcage/cupcake/mini cake tower soon, until then, here’s a picture of the 6 mini cakes from this week.